If you're looking for the Division 2 best weapons, you've come to the right place. The number of guns available in The Division 2 is excessive; there's multiple variants of almost every single weapon, so it's not easy to know at a first look which are the absolute Division 2 best weapons. I've spent almost 150 hours in the world of The Division 2 and in my time exploring Washington D.C., I've used almost every gun there is to be found. Here are the Division 2 best weapons for every scenario. I need to kick this guide off by explaining your experience with specific guns will be different. 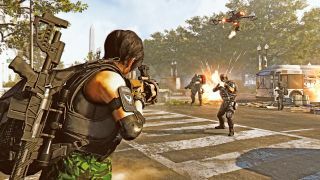 This guide is opinion based after my rigorous testing of almost all of the core guns in the game, and while there are individual stats for every weapon, the Division 2 best guns ultimately comes down to the ones that suit your play style the best. For individual stats of every single weapon, Reddit user /u/AdmiralRegis has a wonderful spreadsheet that includes everything you could ever dream of. This is the source for all of the damage numbers referenced herein. All stats are normalized however, which means that's how much damage they'll do in normalized PvP. In PvE, the values will differ, but my weapon recommendations will stay the same. Now, let's look at the Division 2 best weapons - excluding the Division 2 Exotics, because they're in a class of their own and aren't obtainable until the endgame. Starting off with possibly my favourite gun in the whole game, the M60 LMG is a true powerhouse. Light Machine Guns in general aren't great for long range combat because the kickback on them is insane, but the M60 deals ridiculous damage per second - near the top of all automatic weapons - and it can fire 100 bullets before it needs a reload. Whether you want to use the M60 as your close range or mid range weapon boils down to the weapon mods you equip. Focus on increasing your critical hit chance/damage and damage to elites for the former, or if you want the latter, opt for an improvement in accuracy, stability, and optimal range. If you can raise your critical hit chance to +50%, with 100 rounds per belt, that's a lot of critical hits. The Model 700 undergoes a small nerf on April 5, but that shouldn't knock it from its spot as the best Marksman Rifle available. Also, this is specific to the base Model 700 - the M700 Carbon & Tactical aren't anywhere near as powerful. The reload time is long on this absolute cannon, but when you're using it to start fights on enemies that haven't seen you yet then switching to your other weapon as they advance on your position, it doesn't matter. You can make heads explode before they even know you're there. I like the starting VX1 Scope with the 12x magnification, especially since it applies +30% headshot damage, but it makes the reload take even longer. If you can put up with the absurd reticle with the CQBSS Scope (8x), definitely switch because it has +35% headshot damage in exchange for -20% accuracy. You'll be resetting your aim after every shot with this monster anyway, so the -20% accuracy won't have much of an effect. Alternatively, you could rock a close range scope and utilise the third-person crosshairs to use the Model 700 at a closer distance. The P90 Submachine Gun has been seen in a number of online shooters, and it always tends to be one of the very best. That's no different in The Division 2, because even though it has the absolute lowest DPS (damage per second) in the weapon class, it holds 60 bullets per magazine and provides a constant damage output without having to reload for a while. Some players opt to spec into the Vector because it has the highest RPM and DPS in the class, but with only 19 bullets per mag, it means you're reloading almost constantly. Throw a Reflex Sight on the P90 and focus on increasing your critical hit chance, and you'll be dealing much more damage than the stats would imply. To be fair, you can't go much wrong with any of the Assault Rifles in The Division 2. They all offer a very similar DPS and you'll only really find your favourite by using them extensively. With that said, the Mk16 has the longest range and is the best choice if you're using it alongside something like an SMG, because the other Assault Rifles would leave you stuck with two guns that perform the same job. To help with targets at a longer range, it also has one of the slowest RPM rates in the class at 625. Look for mods that improve the accuracy and stability, and the Mk16 can destroy enemies from mid-long range. If you need a close range Assault Rifle on the other hand, look toward the FAMAS or the P416; the former has the highest RPM in the class (alongside the CTAR) while the latter combines a fast RPM with a high damage stat for a decent all-rounder. Alongside the Model 700, the Mk17 is also receiving a slight nerf on April 5. It was by far the best Rifle in the game and while this nerf will bring it more in line with the other Rifles, there's a good chance it will still be at the top. It was possible to find a PvE Mk17 with upwards of 40k damage while the other Rifles were sat in the 20k range, but this nerf should only take it down to around 30k. The Mk17 is absolutely wonderful at headshots, with one of the slowest RPMs in the class, so it can almost fill the same role as a Marksman Rifle. It's much more versatile though, in that it will demolish any enemies running at you before you switch to something suited for a closer range. Don't bother with a magnified scope though; stick to the crosshairs because it'll become useless at close range if you don't. Shotguns in The Division 2 are all fairly useless unfortunately, but the Spas-12 is the best of a bad bunch. If you really want to try running a Shotgun, the Spas-12 is the best all rounder; it has the second highest damage, behind only the Double Barrel but obviously that only holds two shells at a time. The Spas-12 has eight so you can output solid damage providing you can hit all your shots. The Flexible Tubular Spring is by far the best mod option, because it improves the slow reload speed by 30%, which is the biggest drawback to the Spas-12. In exchange, you lose 10% critical hit chance but on a single shot gun, critical hits are much less important. The D50 is far and away the best Pistol available in The Division 2, because each bullet deals insane damage - more than some of the Rifles. When you can have a hand cannon as your third weapon that deals so much damage, why wouldn't you? it only contains eight bullets per magazine but since it reloads in under two seconds and you'll mainly be using it to pistol whip enemies when you quickly switch at close range, the small size won't come into play much at all. If you can't get your hands on a D50 (though you really should as explained in our Division 2 Liberty Exotic guide), the M1911 is a worthy substitute when you apply the Extended Pistol Mag. Need more Division 2? Here are our top tips for levelling up fast.